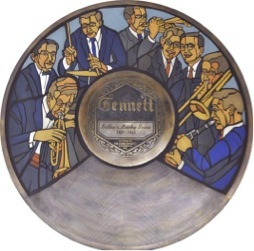 November 7th in Gennett History, 1923: Bailey’s Lucky Seven recorded “Roamin To Wyomin” in NYC on Gennett 5301. Of the musicians known, this recoding featured Earl Oliver (c), Charlie Panelli (tb), Frank Signorelli (p), Nick Lucas, Tony Colucci or John Cali (bjo), and Jack Roth (d). This entry was posted in Gennett, Gennett Walk of Fame, November and tagged Bailey's Lucky Seven, Charlie Panelli, Earl Oliver, Frank Signorelli, Gennett, Gennett 5301, Gennett Discography, Gennett Records, Gennett Walk of Fame, Jack Roth, John Cali, Nick Lucas, November, Tony Colucci. Bookmark the permalink.